Hampshire Schools Library Service - Working in the curriculum - half day training session. Dalmain Primary, Lewisham - re-development of existing library. 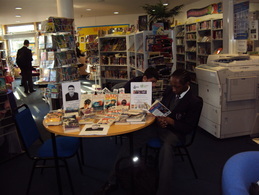 East London Science Free School - advisory visit on library and literacy development. Advisory visit, audit, weed, report and book purchase for King's House Prep School, Richmond. Ellington Infants, Ramsgate - re-development of existing library; weeding and sorting library and classroom collections; audit and stock recommendations. All Faiths' Community School, Strood- weed, audit and re-development of library , stock recommendations. Fossdene Primary, Greenwich - re-development of library. Girls' School Association - Bromley High School - talk on Web 2.0, E- books and apps. Iwade and Bobbing Village Schools, Medway- stock audit and advisory visit. Riverley Primary, Waltham Forest - advising on development of new library- shelving, design, etc. "Laura is a truly exceptional school Librarian. Her passion for books and reading is infectious, combined with her excellent organisational skills and willingness to work long hours to make a success of learning through the Library in all its forms. Students, staff and parents alike have all been inspired by her ideas and dedication. She has made a huge difference to the College here in Singapore during its first two years and will be sadly missed." Graham Wilson, Head of Senior School, Dulwich College Singapore.
" Laura Taylor was an outstanding librarian at the City of London Academy in Southwark.............................. 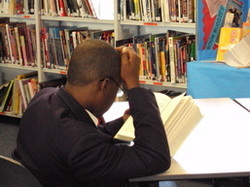 The library was a wonderful learning environment: interesting, lively and stimulating. It was always busy at break and lunch times and after school: pupils described the library as a “great place to find out and learn.” Laura is an educator who expects pupils to learn and indeed challenges all of them. She is an excellent trainer and senior member of staff with regard to the development of teacher research and reading skills. She is an expert in communicating with parents about their key role in helping with their children’s reading. She is vastly experienced in her work with children and reading and passionately believes that all pupils will benefit from focussed attention on their comprehension abilities in a stimulating environment: the library can offer this in a way that is often more effective than a classroom. This applies to pupils with learning difficulties as much as to other pupils, including those who are gifted and talented.............................She is always fully aware of the developments in children’s reading and in the role of school libraries in helping learning. It was a privilege to work with such a stimulating and expert senior member of staff as Laura at the City of London Academy. I am very pleased to endorse Ms Taylor’s new venture as an education and library consultant. Her knowledge and expertise will benefit any school, whether primary, secondary, or tertiary." Martyn Coles, Director of Education, Creative Education Academies; Education Adviser,The Haberdashers’ Company. "She has built school libraries into attractive and stimulating places where students want to be. Her knowledge, skills, hard work and enthusiasm have enabled her to design and maintain an environment which stimulates students to read and supports their learning. She has practically encouraged reading and supported literacy development by arranging book weeks, author visits, competitions and challenges. All of which are highly successfully and very efficiently run."